Prof. Tokhi is world authority in active control of noise and vibration and has specialist knowledge and expertise in robotics, control and systems engineering. 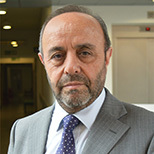 He has extensive research experience in assistive robotics tailored to addressing rehabilitation and mobility needs of elderly and the disabled, control of acoustic noise and vibration, computational intelligence with specific focus on development of bio- and nature-inspired optimisation algorithms for solving complex science and engineering problems, adaptive/intelligent control and high-performance real-time computing. He has authored/co-authored in excess of 750 publications, including research monographs, text books, and journal and conference research articles in these areas, and has supervised more than 55 PhD projects to successful completion. Prof. Tokhi has taught a wide range of subjects in undergraduate and postgraduate taught degree programmes. These have included fundamental topics such as mathematics and physics through to medium and advanced level topics such as analysis of linear systems, analogue and discrete control system analysis and design, digital signal processing, active control, adaptive filtering, self-tuning and adaptive control, distributed real-time systems, random processes, robotics, and computer architectures. He has also given invited short courses, seminars, tutorials, workshops and lectures on advanced topics at various higher education institutions and at international conferences. TOKHI, M. O. and AZAD, A. K. M. (2017). Flexible robot manipulators: Modelling, simulation and control, 2nd edition. The Institution of Engineering and Technology, Stevenage, UK. ISBN: 978-1-84919-583-6. TOKHI, M. O. and AZAD, A. K. M. (2008). Flexible robot manipulators – Modelling, simulation and control, The Institution of Engineering and Technology, Stevenage, UK. ISBN: 978-0-86341-448-0. TOKHI, M. O., HOSSAIN, M. A. and SHAHEED, M. H. (2003). Parallel computing for real-time signal processing and control, Springer-Verlag, London. ISBN: 1-85233-599-8. TOKHI, M. O. and VERES, S. M. (2002). Active sound and vibration control – Theory and applications, The Institution of Electrical Engineers, London. ISBN: 0-85296-038-7. AZAD, A. K. M., TOKHI, M. O. and SHAHEED, M. H. (2007). A software environment for intelligent modelling and simulation of flexible manipulator systems, Computers in Education Journal, XVII, (4), pp. 86–103. TOKHI, M. O., AZAD, A. K. M. and POERWANTO, H. (1999). SCEFMAS: An environment for dynamic characterisation and control of flexible robot manipulators. International Journal of Engineering Education, 15, (3), pp. 213-226. TOKHI, M. O. and MOHD HASHIM, S. Z. (2005). Interactive learning framework for dynamic simulation and control of flexible structures. ASEE Illinois-Indiana Section Conference, Illinois, USA, 01 – 02 April 2005. Prof. Tokhi’s current research activities and interests are grouped into four main areas as described below. The research programmes have received funding from national and international sources including the EPSRC, British Council, and the European Commission. New and efficient biological-inspired optimisation algorithms based on evolutionary algorithms, swarm intelligence (particle swarm, bacterial foraging, bee colony, firefly, invasive weed, spiral dynamics, etc.). Hybrid neural networks, fuzzy logic and bio-inspired optimisation techniques. Model-based and non-model-based control system design. Mechanisms for active exercise regimes. Mobility assistance with reconfigurable smart wheelchair mechanisms. Robust design of active control systems. Modelling, simulation and control of flexible manoeuvring systems, such as flexible robot manipulators, overhead cranes, and air vehicles. The performance demands of modern signal processing and control systems often exceed the capacity of conventional computing platforms and require alternative solutions for real-time performance. Appropriate matching of hardware granularity to task size is essential to fully exploit the computational power available. It is therefore inevitable that the architecture is a heterogeneous one. This programme seeks to exploit capabilities of single processors and to integrate a variety of processors within unified architectures for complex signal processing and control applications. The approach involves development of software environments to support the design, implementation and testing of such architectures. Member (2006) of CLAWAR Association (CA). General Conference Chair: CLAWAR 2016 (London, Sept 2016), CLAWAR 2005 (London, Sept 2005), IEE Inter-Active (online, 1999, 2001), UK Robot Ethics Workshop (Sheffield, 2013). Membership of Program Committee of an extensive number of international conferences. Organiser of special sessions and session chair at several international conferences. Prof. Tokhi is currently external examiner of UG programme in Electronic and Robotics Engineering, at the University of Central Lancashire, UK. He has previously acted as external examiner of taught programmes at University Malaysia Pahang during 2010-2012 and LSBU during 2004-2009. He has further acted as external examiner of over 50 PhD programmes at national and international higher education institutions.